The origin of the name Bradshaw comes from the Township of Bradshaw in the Parish of Bolton-Le-Moors, Lancashire, England. In the early 13th century this old district of Bolton was called "Bradeshaghe" meaning a "broad wood" or copse. “In 1298, William son of Richard (son of Ughtred) de Bradshagh and Mabel his wife, were in possession of the manors of Haigh and Blackrod, which were Mabel's right as heir of the last-named Hugh le Norreys. Her husband from his name is supposed to have been a descendant of the Bradshaghs of Bradshaw, near Turton. 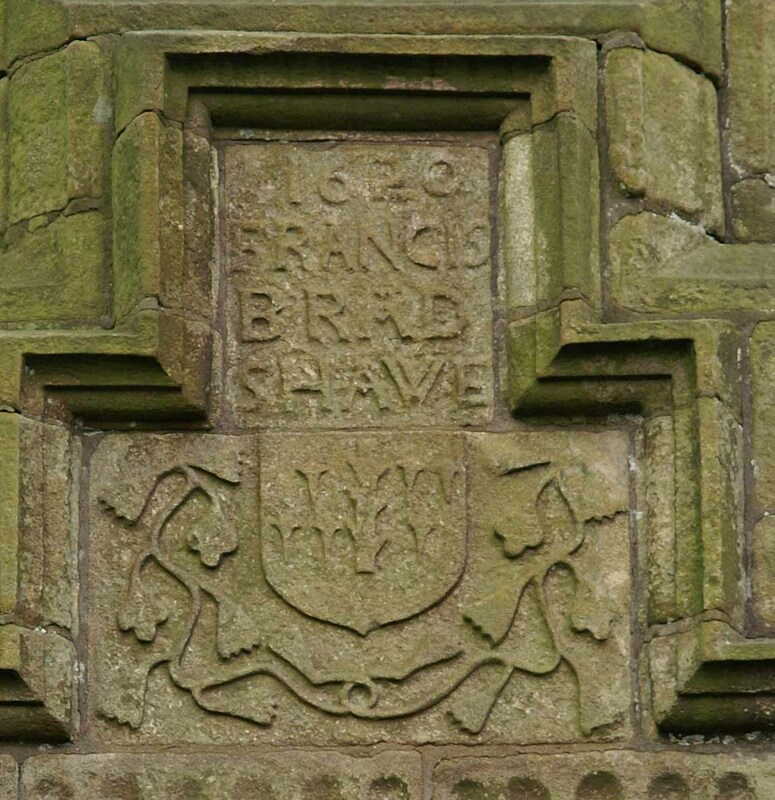 "Of the period 1350 -1500, we have but fragmentary evidence of the Bradshaw family and their activities at Bradshaw, but the name de Bradshaw occurs many times in inquisitions post mortem, marriage settlements, and indeed law suits." 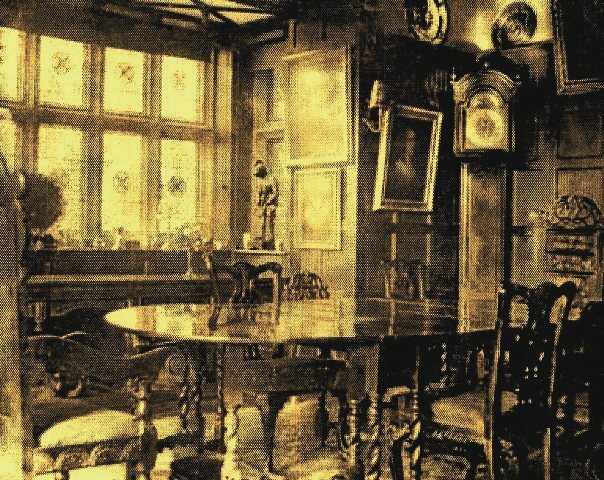 On 27th March 1694, John Bradshaw Senior entered into a legal contract for the sale of the remainder of his estate and Lordship to Henry Bradshaw of Marple Hall. The sale was completed within six months and "included the Coat of Arms (Bradshaw of Bradshaw) of John Bradshaw the father and the son and liberty to quarter the same with the said Henry Bradshaw's own Coat of Arms" - selling price £4000. 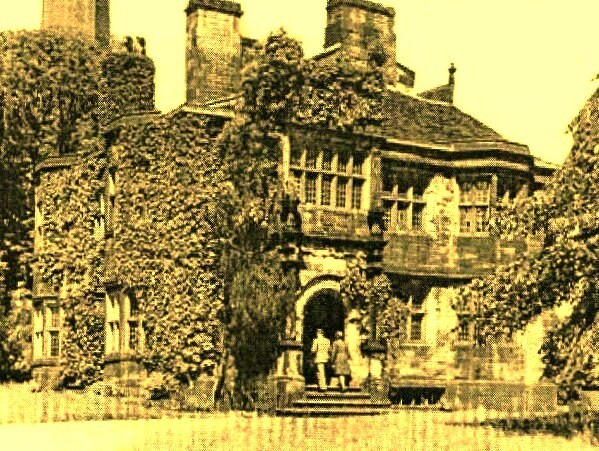 Marple Hall became derelict in the 1940's and was eventually demolished and grassed over by Marple Council. 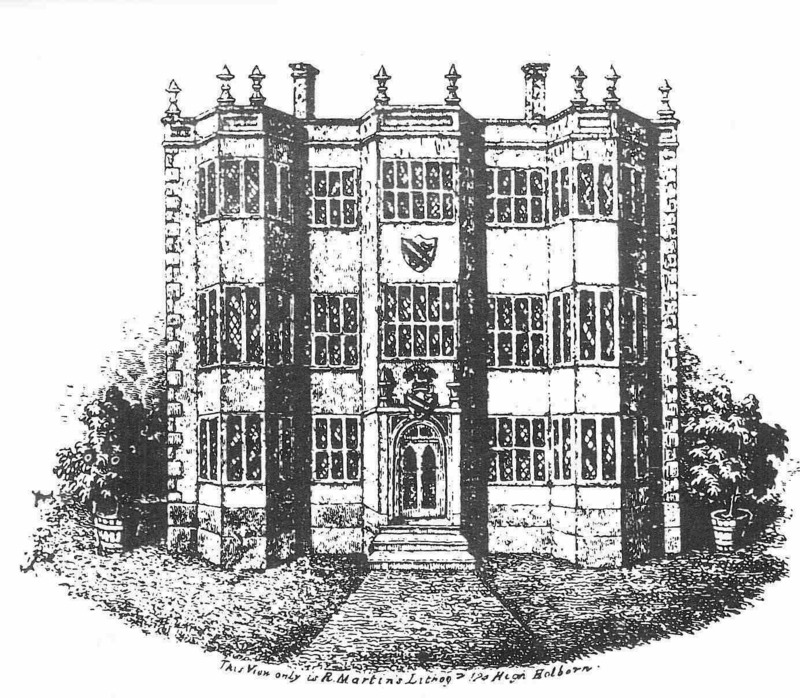 Sir Roger Bradshaigh, first Baronet, was born on 13 January 1628 at Haigh Hall, near Wigan and died 31 March 1684. Sir Roger had been responsible for establishing the Haigh Colliery as one of the largest in Lancashire. 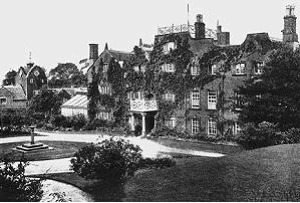 When Sir Roger Bradshaw, the last Baronet died in 1787 without issue, the Manor and Estate passed on to his sister Elizabeth who was married to John the son of Sir Henry Edwin. 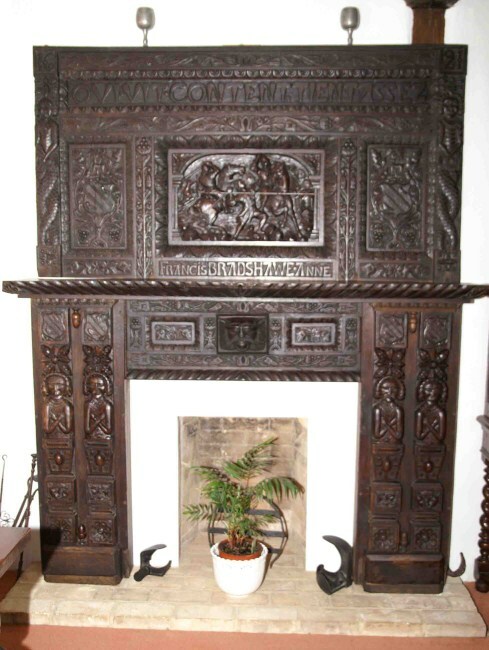 “About 1630, George Bradshaw, gentleman of Bradshaw in Derbyshire, married Elizabeth Callum, daughter of Sir Hugh Callum and Mary F Emerson of Cloughwater”, Co Cavan. 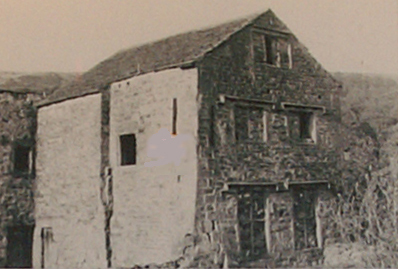 George (1587-1646) of Bradshaw Hall in Eyam may well have been a merchant in Dublin. He was involved with his Uncle Peter who had lands in Ireland. Peter was a prosperous merchant and operated out of London, at The Sign of the Antelope, in Watling Street. 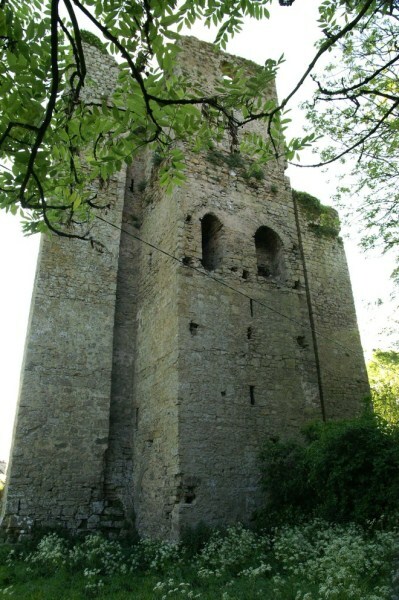 George's wife, Elizabeth (1613-1671), was the daughter of Captain (later Sir) Hugh Culham (Cullum) of Cloughouter Castle in County Cavan. She may have been born at Cloughouter. Hugh Culham was the son of Hugh Culme, Esq. 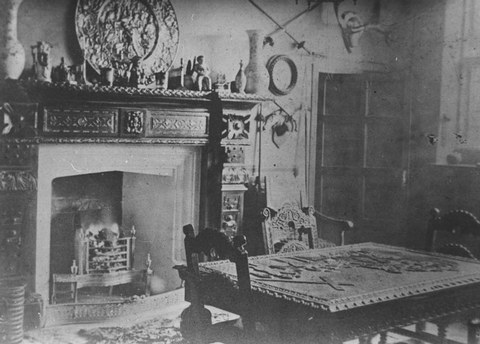 of Chanston and Cannonleigh, Devonshire. Argent, two bendlets between two martlets sable (Bradshawe), Impaling, or, a chevron, gules, between three martlets, sable (Stafford) with a crest above, a stag at gaze (statant) proper under a vine tree, fruited, proper (Bradshawe). The tricking of the arms bears the impress of the work of an amateur. 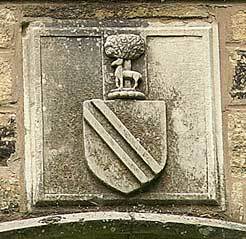 The Stafford arms, borne by his mother as an heiress, ought to have been quartered by Francis Bradshawe, with the Bradshawe arms on the dexter shield; while the Davenport arms, as borne by his wife, should have been impaled. This error has misled genealogists into a supposition that the Hall and arch were built by his father........"
Arms - Two Bendlets between two Martlets. Crest – On a wreath, on a mount a stag statant. under a vine, fructed. The book Victoria History of Lancashire, states that in 1306, Robert de Bradshaw was the first Bradshaw named tenant of the Township. The coat of Arms - Bradshaw of Bradshaw, is the original, from which subsequent Bradshaw Arms have been derived. Bradshaw Coats of Arms include; Bradshaw of Bradshaw (Township of Bradshaw, Bolton), Bradshaw of Haigh Hall (near Wigan, Lancashire), Bradshaw of Marple (Cheshire), Bradshaw of D’arcy Lever (near Bolton, Lancashire) and Bradshaw of Milecross (Newtownards, Co Down). Died at Southwold, Suffolk, September 1633; buried in St Anne's Chapel, Westminster [Almonry]. Arms - 2 bends sable & a canton checky argent & azure. Crest - On a wreath of the colours Two Keys in pale back to back encircled by a Coronet Or. 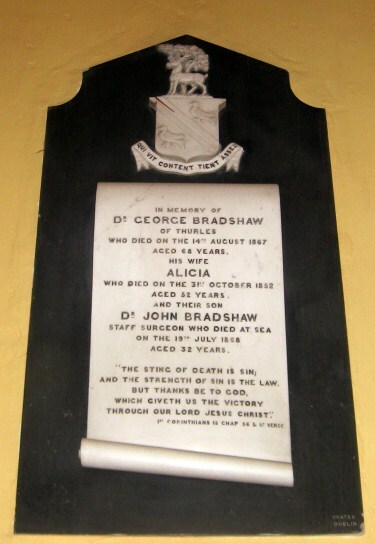 Bradshaigh, or Bradshaw (Haigh, Co. Lancaster, descended from Sir John Bradshaw, of Bradshaw, a Saxon living at the Conquest; the chief of this ancient and distinguished race at the at the period of the civil wars was Sir Roger Bradshaigh, of Haigh, a gallant and devoted cavalier, created a baronet in 1679, extinct, circa 1786). Crest – On a mount vert a stag at gaze ppr. under a vine vert, fructed gu. Crest - On a mount vert a stag at gaze pr. under a vine vert, fructed gu. Crest - On a Wreath, on a mount a stag at gaze pr. under a vine. 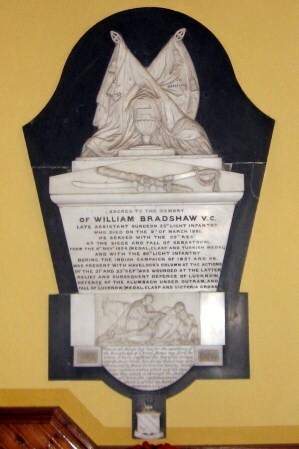 In 1787, William Harden Bradshaw (1764-1845) of 48 Harecourt Street & XI Fitzwilliam Square, Dublin; claimed right to "heir male" of Bradshaigh of Haigh, Lancashire, upon the death of Sir Roger Bradshaw 4th Baronet, who died without issue. Crest - On a mount vert a stag at gaze ppr. under a vine vert, fructed gu. Motto - Qui vit content tient assez. On 6th June 1844, the College of Arms, London granted a coat of Arms to Joseph Hoare Bradshaw & Robert Bradshaw of Milecross, Newtownards, Co. Down. (Reference: College of Arms Mss 107, Pages 284 & 285) Joseph and Robert are great great grandsons of James Bradshaw, son of William Bradshaw and Elizabeth L Beaumont of Prestwich Yarith (now Manchester) in Lancashire, England. James came to Ireland in 1649 as a soldier in Cromwell's army and was Captain of the Forlorn Hope at the storming of Drogheda Castle. Crest - On a Wreath (Argent and Sable) "On a Mount Vert a Buck statant beneath an Oak tree proper"
A four-generation pedigree of Bradshaw of Pendleton headed by James Bradshaw of Hope, Lancashire and his wife, Alice Robinson. A four-generation pedigree headed by William Bradshaw, the second son of Henry Bradshaw of Bradshaw, Derbyshire. Crest - A mount vert, thereon a stag statant ppr., gorged with a collar grenel Or, between two oak trees also ppr. Arms - Sa. Two bendlets raguly betw. as many hawks ar. Two fleur-de-lis of the first, on the pale a cross patonce Or. Crest - A Wolf's Head erased arg., collared and Lined Or. 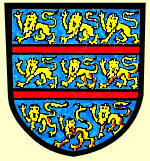 On March 18, 1576, arms was granted to Anne the wife of Henry Stanley, of Sutton Bennington, Nottinghamshire, daughter of Richard Bradshaw of Bonny, Nottinghamshire. In 2000, the London College of Arms granted the above Bradshaw Family Patent to all male descendants of William Philips Bradshaw (1770-1827). 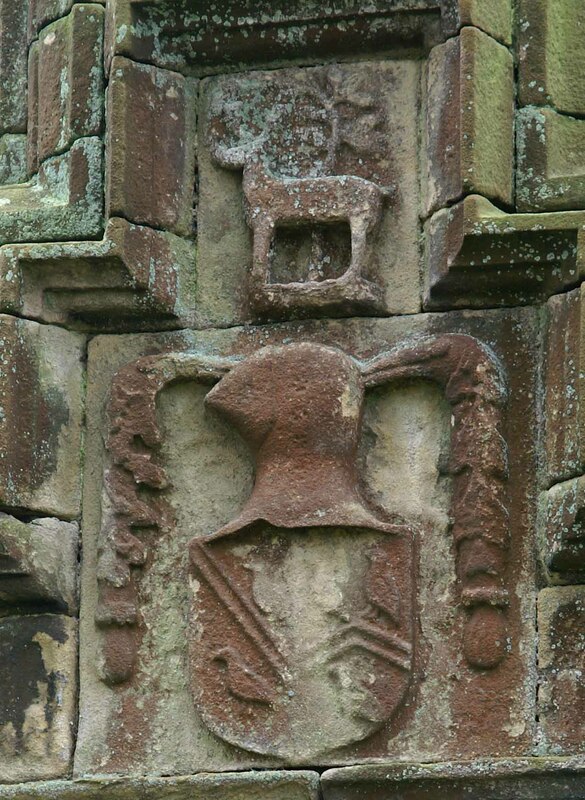 The knight's helmet represents military service, the corn by the stag and in the wheat sheaths are for the farming / milling connection. "There is no such thing as a 'coat of arms for a surname'. Many people of the same surname will often be entitled to completely different coats of arms, and many of that surname will be entitled to no coat of arms. Coats of arms belong to individuals. For any person to have a right to a coat of arms they must either have had it granted to them or be descended in the legitimate male line from a person to whom arms were granted or confirmed in the past." When married, a woman may unite her arms with those of her husband in what are called marital arms; their arms are impaled, meaning placed side by side in the same shield, with those of the man on the dexter and those of his wife on the sinister. If one spouse belongs to the higher ranks of an order of chivalry, and thereby entitled to surround his or her arms with a circlet of the order, it is usual to depict them on two separate shields tilted towards one another, termed accollé. A married woman may also bear either her own arms or her husband's arms alone on a shield with a small differencing mark to distinguish her from her father or husband. If the woman is an heraldic heiress, her arms are shown on an inescutcheon of pretence (a small shield) in the centre of her husband's arms. When widowed, a woman continues to use her marital arms, but placed on a lozenge or oval.